St. John of the Cross, in his work “The Ascent of Mt. Carmel,” has left us a drawing which sums up, expresses in synthesis, the whole of spiritual life. It is the outline of a mountain which summit, the Cross of Our Lord (above) – symbolized by St. John in his illustration with a circular inscription: “only the Honor and Glory of God remains” – represents the state of Christian Perfection. The “Ascent” is symbolized by three paths, the goods of the earth: honor, repose, taste, liberty, science; the goods of heaven: glory, security, joy, consolation, knowledge; and, the narrowest, which alone reaches the summit, is the way of “nada” (Spanish which means “nothing”) – the way of the Crucified’s total abnegation and abandonment on the Cross. The soul arrives at this supreme height, when, like his Beloved Crucified, dominated by perfect charity – the love of Christ for His Father, first; and, His love for souls that they may be saved from the eternal torments reserved for the devils – he adheres totally to the divine will, and moved by that divine will alone, tends solely to the glory of the Most Holy Trinity. The path which leads to sanctity, that is, to God, can be marked out only by God Himself, by His will. Not everyone that says to Me, Lord, Lord, shall enter into the kingdom of heaven, but he that doth the will of My Father Who Is in heaven (Mt. 7.21). Therefore, the only road that can bring us to the summit of perfection is the rugged path of “nothing” which leaves aside the two easy roads of the “imperfect spirit” (that is, by using “creatures” or the goods of the earth and the goods of heaven as means to an end – which is, the eternal possession and enjoyment of God Himself, no more no less); these end half-way up the mountain and can go no farther. The imperfect spirit is one that is “attached” to the things of earth, or even to spiritual goods, using these goods in a disordered way and with a view to personal satisfaction. In order to leave the “road of the imperfect spirit,” we must no longer love anything, unless it be in perfect conformity with God’s will. He that loveth father of mother more than Me, is not worthy of Me… (Mt. 10.37). In fact, every object which we love for itself and not according to God’s will, becomes for us a source of preoccupation, desires, distress, and anxiety; it moves our hearts and makes us act only for our own satisfaction. In a soul attached to created things, how many principles of action there are which are not conformable to God’s will! Such a soul finds itself on these “paths of the imperfect,” which will never take it to the goal. “God communicates Himself most to the soul that had progressed farthest in love: namely, that has his will in closest conformity with the will of God” (St. John of the Cross, “Ascent of Mt. Carmel,” Bk. II, 5.4). In ordinary life, true love is manifested in willingness to do what pleases the person loved; in conforming oneself to his desires, tastes, and will, not willing anything which could displease him. The soul unites himself to God in the measure in which it is truly conformed to His will. True love of God consists in adhering perfectly to His holy will, not desiring to do or be other than what God indicates for each of us, to the point of becoming, as it were, “a living will of God.” Seen in this light, sanctity is possible for every soul of good will; it is not impossible that a soul which leads a humble, hidden life, may adhere to the divine will as well and perhaps even better than a “great” saint who has received from God an exterior mission and has been enriched with mystical graces (such as visions, locutions and the like). The perfection of a soul may be measured by the degree to which he does the will of God, and finds his happiness in doing it. In all our actions we are always impelled by love: love of ourselves, love of creatures, or love of God. As long as the soul clings to the least thing contrary to God’s will, that is, to some irregular attachment to self or creatures, it will often act, not under the impulse of God’s love, but through a desire for personal satisfaction, or because of a disordered love of creatures, and therefore, will walk apart from God’s will. Sin is not the only thing which is opposed to God’s will; even the slightest imperfection or deliberate attachment prevents the soul from acting under the motion of God’s will alone. It is evident that this union cannot be perfect as long as the soul resists the divine will, be it only in very small things, or does not accept it readily, or as long as it retains desires and tastes which, even in a very slight way, are not in harmony with the will of God. The whole spiritual ascent to divine union consists in a double movement, very simple but essential: despoiling oneself, like to the Crucified, of all that is displeasing to God, and renouncing all that is in opposition to His will, by conforming oneself to that will and fulfilling it with the greatest love. It is an extremely simple movement, but at the same time an all-embracing one, because it extends to every circumstance of life, without exception, so that in all things, the greatest as in the least, the soul acts in a manner that is in perfect conformity with the divine will. It is also a very profound movement which must reach even to the most secret recesses of the spirit, in order to free it from least residue, the last resistances of egoism and pride, not only eliminating their manifestations but undermining their very roots. As long as this work of total purgation is incomplete, the soul’s will cannot be totally conformed to that of God; its numerous imperfections and imperfect habits are still opposed to this entire conformity. If we examine ourselves attentively, we shall see that our will is still very dissimilar to God’s will. God wills only the good, and He wills it in the most perfect manner. We, on the contrary, often will evil in the guise of good or together with the good; moreover, we lack the strength to do the good that we will, and we realize it only imperfect. Every time we commit any fault, even a simple imperfection, we desire something that God cannot will: these faults include slight acts of slothfulness, negligence, impatience; they may involve a subtle seeking of self or the affection and esteem of creatures; there could be numerous secondary motives which insinuate themselves into our actions. To attain to divine union all these must also be eliminated. St. John of the Cross says expressly that it is not only beginners on the spiritual road,but even the “proficients” who are subject to many imperfection and still retain imperfect habits, proceeding especially from a subtle pride and spiritual egoism. As they have exercised themselves for a long time in the interior life, a certain presumption and self-assurance may easily creep in, through which these souls are exposed to failings in humility and reverence in their relations with God, while in their relations with their neighbor, they often fall into the weakness of desiring to be esteemed as perfect. Furthermore, as they are not entirely detached from themselves, they stop to enjoy, a bit egoistically, the spiritual consolations they receive in prayer; they thy distract themselves from seeking God alone, retard their union with Him, and even expose themselves to falling into the snares of imagination or of the devil (cf., “Dark Night,” Bk. II, 2.2). All this proves how deeply pride and egoism are rooted in us. Scarcely have we detached our hearts from earthly vanities and material goods, than we are immediately ready to attach ourselves to spiritual goods. Yet we must not despair of attaining divine union; we must seize the occasion of our misery to beg with greater insistence that Our Lord may deign to complete the work of our purification. Moreover, He desires it more than we ourselves, and if He does not effect it as He should, it is only because He finds us refractory, impatient, little disposed to accept in good part what humbles and mortifies us to the core. Yet this alone is the way to reach union with God. When the soul no longer has any attachments, and is entirely free from love of self and of creatures (earthly or heavenly), it can adhere to God alone, acting only according to His will, and living moment by moment according to His good pleasure. The soul thus transformed has lost its will in the will of God and therefore is perfectly united to God Himself. This is the essence and the apex of sanctity. This entry was posted in Teresian Carmelite Spirituality and tagged Ascent of Mt. 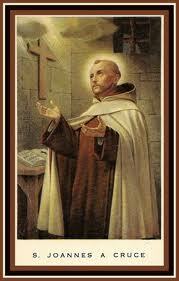 Carmel, Christian Perfection, egoism, pride, sin, spirituality, St. John of the Cross. Bookmark the permalink. You’re welcome, Helen. Thank you, too, and God bless!